MYTH #3 DEBUNKED “Fracking has been going on for decades”. Well it has! One of the main misconceptions here is that the massive amounts of water used are spread over 30 or more separate operations, or ‘stages’. This means that the volumes used are in fact not much different to what has been used for decades. You can see a history of High Volume Fracking in this link. Fracking with massive volumes were being used in the US, the North Sea and Germany in the 1970s, with no issues at all. To say that this is a new technology is nonsense. But even then surely it is an area where engineers must decide. The volumes of water appear to be large, but when you consider they are injected into a MASSIVE target area, it amounts to a fraction of a percent of the volume. The reader will note that none of these are the hydraulic fracturing process. They did many research projects, trying to get the fractures to penetrate out of their target area, and found no cases where it did. There was some criticism from the ‘Science Advisory Board’ as they wanted to include ‘fracking and related activities’. This meant that they wanted to include pollution due to poor fluid handling methods described above, and that are specifically not permitted under UK regulations. 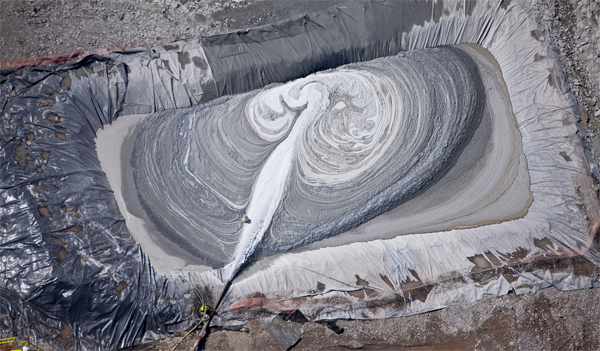 It is common for the anti groups to show pictures of open pits being used to store fluid for example, and pictures of dead cattle that are all due to sloppy US practice, and is nothing to do with fracking. These sources of pollution and poor practice are forbidden under EU and UK law. All of the classic stories from places like Dimock (Pennsylvania) Pavillion (Wyoming) and Parker County (Texas) are due to poor sealing of surface casings, that have lead to gas migration, and they feature badly designed and drilled wells, with few regulations to ensure good practice. They are NOTHING to do with fracking. Any badly drilled well could cause these problems, and there is no evidence that the fracking process has caused any problems, even when it has been done badly! Another point that many do not understand is that the tiny cracks that fracking creates are monitored using sensitive detectors. These can map the growth of fractures in real time, in 3D. If something went wrong, such as fractures migrating up a fault, then the engineers can change what they are doing. Microseismic monitoring is a well established industry to perform this service, and all fears that somehow aquifers will be penetrated have been shown to be false. Its a bit like anything technical these days. It’s a lot more complicated than you might think, and everything has been looked at and thought about! The idea that this is a novel, untested, unregulated unresearched cowboy technology is one of the myths that anti groups have used for ages, but there is no basis for it. Click here for the next debunking 'Public Health'. Note the other uses including water wells and geothermal heat. Since the late 1970s, hydraulic fracturing has been used, in some cases, to increase the yield of drinking water from wells in a number of countries, including the US, Australia, and South Africa.